'I AM KALAM' is an all Kerala science exhibition for higher secondary students which is initiated by Mathrubhumi in collaboration with SRM University. The programme emphasizes on the practical aspects of education with the theme "science in society". The event is designed to find the next generation scientists and aims to promote and nurture science and scientific research among students. It provides a platform for them to showcase their creativity, applicability and talent. 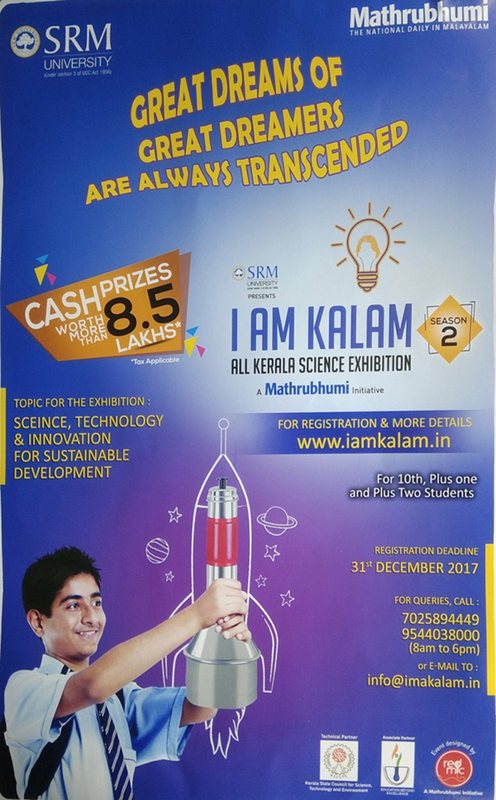 A state level exhibition like this allows every student to nurture his/her curiosity and learn better. Children with scientific temper will never stop questioning, observing physical reality, testing, analyzing and communicating. In an era of competition it's our duty to create such platforms for them. Any higher secondary student(10, 11 & 12th grade) can register online for the event with their own project. The participants for the exhibition are selected from the registered students based on their project. The selection process is overseen by the experts in Kerala State Council for Science, Technology & Environment. First phase will be zonal level competition and the winners from the 6 zones become eligible for state rounds. The zonal level competition is going to held in January 2018 & Finales in February. Perhaps the best science project is one that you come up with creative idea. The creativity can lead to interesting projects. A typical parameter to evaluate if the project is considered to be capable of being done or carried out. The applicability of the project is measured on how the information or knowledge gained in the project can be used. Conclusion & Scope of further development. This is where you answer your research question. Make it from the research and results of the experiment. It is the level of convenience of the project and its usefulness for a variety of activities. Originality is the property of a created piece of work as being new and it must illustrate or investigate some scientific idea. Student should demonstrate and speak well all the aspects of his or her project. Present it with enthusiasm and confidence. A project only work when you properly collect and record your data. Keep it measurable and quantitative.